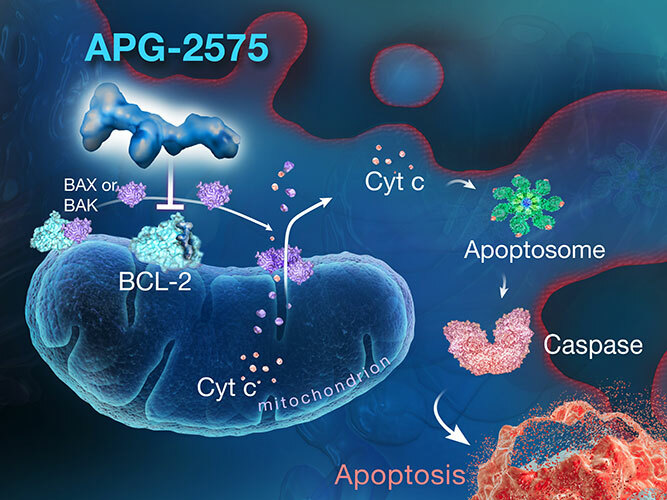 APG-1252 is a novel, highly potent, small molecule drug designed to restore apoptosis through selective inhibition of the Bcl-2 and Bcl-xL proteins. Bcl-xL gene mutation and overexpression have been reported in many tumor types, including small cell lung cancer (SCLC). In preclinical studies with APG-1252, antitumor activity is observed in SCLC, lymphoma, colorectal cancer and metastatic breast cancer. 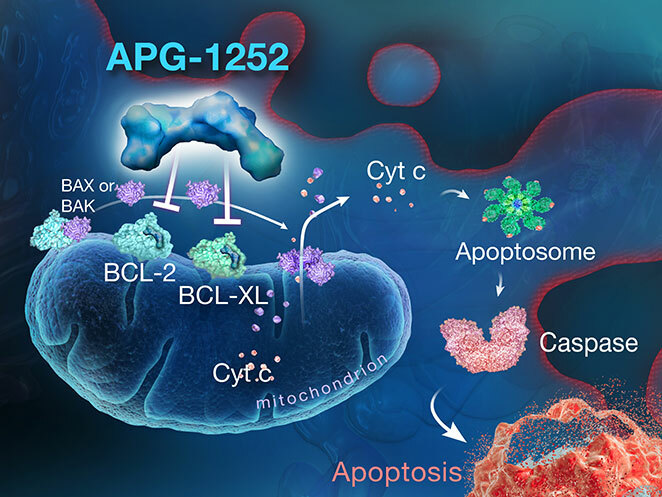 With high potency and sub-nanomolar binding affinity to Bcl-2 proteins, APG-1252 minimizes platelet toxicity by design, has a favorable PK/PD profile and a potentially wider therapeutic window compared to the only other Bcl-2/Bcl-xL inhibitor in clinical development. We are conducting two Phase I trials in advanced cancers in the U.S. and Australia, and a Phase I/II trial in SCLC in China. APG-2575 is a novel, orally administered Bcl-2 selective inhibitor being developed for the treatment of hematologic malignancies with Bcl-2 overexpression, including leukemia, lymphoma and multiple myeloma (MM). The initial indication we plan to seek approval for is CLL. In preclinical studies, APG-2575 has demonstrated antitumor activity as a single agent and in combination with our MDM2-p53 inhibitor APG-115, Bruton’s tyrosine kinase inhibitors, anti-CD20 monoclonal antibodies and phosphoinositide 3-kinase inhibitors, in various B cell malignancies. We have initiated a multicenter Phase I study of APG-2575 as a single agent in multiple hematologic malignancies in the U.S. and Australia. 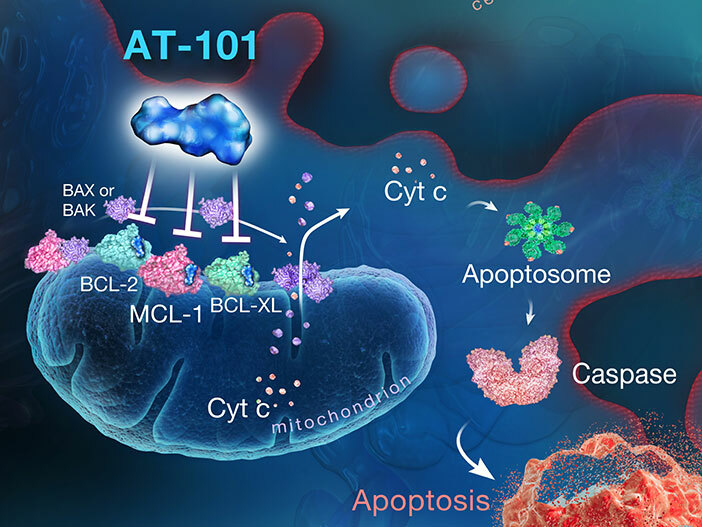 AT-101 is a pan-Bcl-2 inhibitor we are developing for CLL and MM that blocks Bcl-2, Bcl-xL, Bcl-w and Mcl-1 proteins. Since 2005, 14 Phase I and II clinical trials for AT-101 have been conducted among more than 700 patients with solid tumors or blood cancers. Chinese patients were also enrolled in a multinational, multicenter, randomized, double-blinded Phase II trial in non-small cell lung cancer. Results from these trials show that AT-101 is well tolerated. AT-101, either as a single agent or in combinations, has shown anti-tumor activity in CLL or hormone refractory prostate cancer. We are conducting two Phase II trials for AT-101 in combination with lenalidomide or rituximab in relapse/refractory CLL in the U.S. and China. In the Phase II U.S. trial, we opened an additional cohort to study the efficacy and safety of AT-101 in patients with relapse/refractory multiple myeloma. APG-1387 is a novel, small molecule inhibitor of the inhibitors of apoptosis (IAP) proteins we’re developing to treat advanced solid tumors and chronic HBV infection. 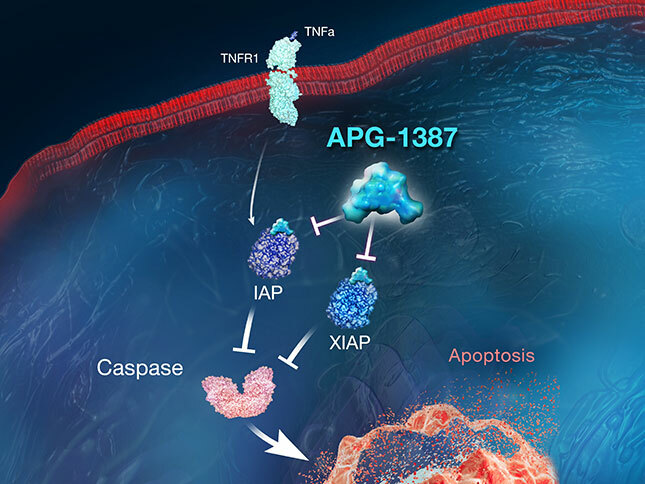 A key advantage of APG-1387 is that it is designed to bind to both IAP protein monomers and dimers; we believe this dual inhibition approach may produce improved activity in many diseases, alone or in combination with TKIs or IO therapies. In preclinical studies, APG-1387 has demonstrated potent anti-tumor activity and the ability to eliminate HBV surface antigens. APG-1387, the first IAP-targeting drug to enter clinical trials in China, has completed the dose-escalation phase in Phase I trials as a single agent in solid tumors in both China and Australia. APG-1387 has been shown to be well-tolerated. We are also conducting a Phase Ib trial in the U.S. of APG-1387 in combination with pembrolizumab (Keytruda) in solid tumors. APG-115 is an orally administered, selective, small molecule inhibitor of the MDM2-p53 PPI. The p53 protein plays an important role in preventing the formation and progression of cancer, and dysfunction of p53 can lead to various cancers. 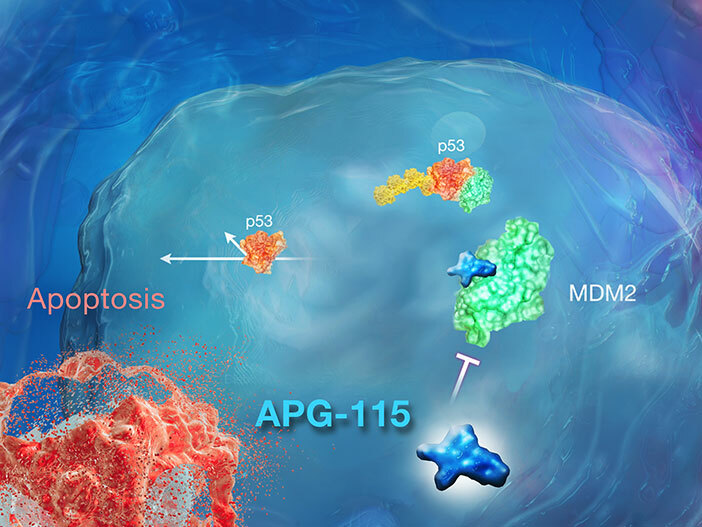 APG-115 was designed to activate p53 tumor suppression activity by blocking the MDM2-p53 PPI. Preclinical studies have shown that APG-115 has strong binding affinity to MDM2 and an ability to activate p53. We believe that the compound has best-in-class potential and may overcome the chemical stability issues observed with other MDM2-p53 inhibitors in development. We are conducting Phase I clinical trials in China and the U.S. in adenoid cystic carcinoma (ACC) and sarcomas. And we have initiated a Phase II combination study of APG-115 with pembrolizumab in unresectable or metastatic melanoma in the U.S.